Integrating Arab e-infrastructure in a Global Environment, e-AGE, is an annual international conference organized by the Arab States Research and Education Network, ASREN. 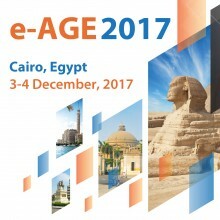 Since the launch of ASREN in December 2010 at the League of Arab States, it was decided to organize e-AGE every year in one of the Arab countries. e-AGE is in line with ASREN’s major objectives that are related to dissemination and awareness, promotion of research collaboration and joint activities, and establishment of research networks in the Arab region and worldwide. 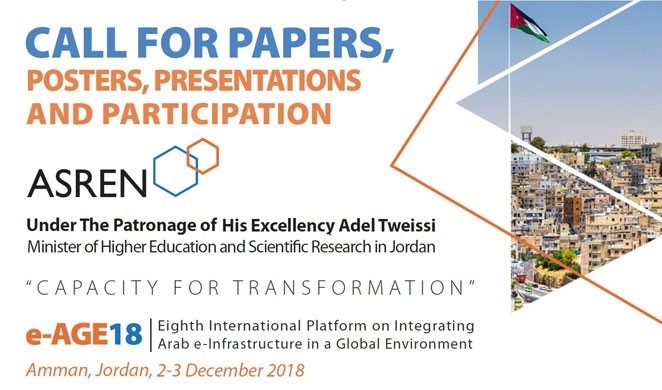 In 2018, e-AGE will be held under the patronage of HE Professor Adel Tweissi, Minister of Higher Education and Scientific Research, in Amman, Jordan during 2-3 December 2018. In e-AGE18, the focus will be on demonstrated successes in using the research and education e-Infrastructures at national, regional and global levels. In short words, e-AGE18 is coming with “CAPACITY FOR TRANSFORMATION” as the main theme of the conference and all activities are centered on it. A call for participation is currently open.